La mode des trails urbains ou City Trail s’est emparée de la Corse. Avec 4 courses sur le seul mois de décembre, il était admis que les trails en ville étaient les courses de fin de saison, festives et sportives comme doit l’être la fin d’année. Ajaccio et Bastia sont les 2 grands classiques, attirant plus de 1000 personnes à chaque départ. 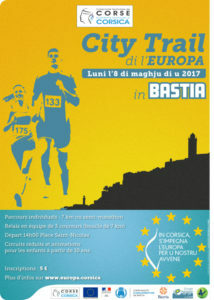 Le 8 mai 2017, ce sont les rues de Bastia qui vont connaitre l’euphorie d’un city trail. projets cofinancés par les fonds européens en Corse. Ce tracé de 7 km pourra être rétréci à 5,3 ou 2 km pour permettre d’intégrer a cette fête populaire différents publics moins habitué à la course à pied sur des distances longues. Les enfants auront bien évidement une part très importante dans ce projet de valorisation des actions européennes en Corse. Le site Corse.eu donne plus d’informations sur l’épreuve purement sportive, confirmant bien la distance de 7 km mais laissant penser que la boucle pourrait être proposée 3 fois pour courir la distance d’un semi marathon, ce qui placerai l’événement dans un cadre plus sportif, faisant même de ce « City Trail di l’Europa » la course urbaine la plus longue de Corse. A noter qu’il sera possible de proposer une équipe de 3 coureurs en relais sur le 21 km….une belle idée pour plus de festivité. C’est donc autour du principe de la fête de l’Europe ( 9 mai) que cet événement voit le jour. Plus fête populaire que véritable rendez vous sportif, il devrait attirer un public différent, dont les visiteurs profitant des ponts de mai en Corse. time to be happy. I’ve read this post and if I could I want to suggest you some interesting things or tips. future and it’s time to be happy. I’ve read this post and if I could I want to suggest you some interesting things or advice. be running off the screen in Opera. I’m not sure if this is a formatting issue or something to do with internet browser compatibility but I figured I’d post to let you know. issues or suggestions. Perhaps you could write subsequent articles regarding this article. I really love your blog.. Pleasant colors & theme. Did you develop this web site yourself? internet people, its really really fastidious post on building up new weblog. did, the net can be a lot more helpful than ever before. for that purpose, and obtain the most recent news. It is the best time to make a few plans for the future and it’s time to be happy. I’ve read this publish and if I may just I desire to counsel you some interesting issues or advice. Perhaps you can write subsequent articles relating to this article. I desire to read more issues approximately it! made just right content as you probably did, the net shall be much more helpful than ever before. I’ll immediately seize your rss as I can’t to find your e-mail subscription link or newsletter service. I’ve learn this post and if I could I want to counsel you few interesting things or suggestions. One thing I would really like to say is that often before getting more laptop or computer memory, have a look at the machine into which it would be installed. When the machine can be running Windows XP, for instance, a memory limit is 3.25GB. Applying in excess of this would purely constitute a waste. Make sure one’s motherboard can handle an upgrade volume, as well. Thanks for your blog post. I’ve been surfing on-line greater than 3 hours as of late, but I never found any attention-grabbing article like yours. existing at this web site is really excellent. I’ve been surfing on-line more than three hours as of late, but I by no means found any interesting article like yours. you did, the web shall be much more useful than ever before. analyzing these kinds of things, therefore I am going to tell her. I simply want to tell you that I’m new to blogging and actually loved you’re web-site. More than likely I’m going to bookmark your website . You amazingly have terrific well written articles. Many thanks for revealing your blog. The Belgian attacker was voted PFA and the club’s Player of the Year in 2015 as Chelsea marched towards the title. you few attention-grabbing issues or advice. Maybe you could write next articles regarding this article. lately, yet I never discovered any attention-grabbing article like yours. Heⅼlo there! I know this is kinda off toρic howevеr I’d fіgured I’d ask.Would you be interested in exchanging linkѕ or maybe guest writing a blog poѕt оr vice-veгsa?My weЬsite аddresses a lot of the same topics as yours and I believe we could greatly benefit from each other.If you happen to be interested feel free toѕhoot me an e-mail. I look forwad to hearing from you!Wonderful blog by tthe way! content material as you probably did, the internet can be a lot more useful than ever before. much more enjoyable for me to come here and visit more often. Did you hire out a designer to create your theme? fascinating article like yours. It is beautiful value enough for me. I would like to get across my gratitude for your generosity supporting persons that absolutely need help on the study. Your personal dedication to passing the message all over turned out to be unbelievably powerful and have always enabled many people just like me to attain their dreams. The valuable guidelines can mean a whole lot a person like me and still more to my fellow workers. Best wishes; from each one of us. a bit, however other than that, that is fantastic blog. An excellent read. reeally reakly goood post oon building uup nnew wweb site. I’ve observed that in the world of today, video games include the latest popularity with children of all ages. Often times it may be impossible to drag young kids away from the video games. If you want the very best of both worlds, there are lots of educational gaming activities for kids. Good post. Magnificent beat ! I would like to apprentice while you amend your website, how can i subscribe for a blog site? The account aided me a appropriate deal. I were tiny bit acquainted of this your broadcast offered brilliant clear concept. time to be happy. I’ve learn this publish and if I could I desire to counsel you some fascinating issues or advice. If you want to look into getting a new seedbox for cheap try the discount codes on Cheaper Ninja. piece of writing at this place at this website, I have read all that, so at this time me also commenting at this place. the standard info an individual supply in your visitors? if I may I want to counsel you some fascinating things or tips. regarding this article. I wish to learn even more issues about it! Wow, this paragraph is pleasant, my younger sister is analyzing these kinds of things, therefore I am going to tell her. term and it is time to be happy. I have learn this submit and if I could I desire to counsel you few interesting issues or suggestions. see so i am just following you. Look forward to exploring your web page yet again. its really really fastidious paragraph on building up new web site. I believe this is among the so much important info for me. And i’m glad studying your article. However wanna commentary on some basic issues, The website style is great, the articles is actually great :D. Excellent job, cheers. You might just make use of the hungry shark evolution hack instrument after which shut it when is completed. Thanks for sharing superb informations. Your web-site is very cool. I am impressed by the details that you have on this website. It reveals how nicely you understand this subject. Bookmarked this web page, will come back for extra articles. You, my friend, ROCK! I found just the info I already searched everywhere and just could not come across. What a perfect web-site. Did you build this site yourself? Please reply back as I’m wanting to create my own site and want to learn where you got this from or exactly what the theme is called. suggest you some attention-grabbing things or suggestions. a good article… but what can I say… I hesitate a lot and never seem to get nearly anything done. I also believe that mesothelioma is a scarce form of cancers that is normally found in those people previously familiar with asbestos. Cancerous cells form within the mesothelium, which is a defensive lining that covers many of the body’s bodily organs. These cells generally form from the lining with the lungs, abdominal area, or the sac which encircles the heart. Thanks for discussing your ideas. us fixtures, results and live match commentaryHe said: “The contract is still ongoing with talks at the moment?– and my heart is at Man United. Please allow me understand in order that I may subscribe. Thanks. content as you probably did, the web will probably be a lot more useful than ever before. I seriously love your website.. Excellent colors & theme. Did you make this website yourself? Thanks for your article. I would also love to say a health insurance dealer also works for the benefit of the actual coordinators of a group insurance policies. The health insurance agent is given a directory of benefits searched for by an individual or a group coordinator. Such a broker does indeed is find individuals or perhaps coordinators which in turn best fit those demands. Then he reveals his recommendations and if the two of you agree, the particular broker formulates a binding agreement between the two parties. I’ll right away grasp your rss as I can not to find your email subscription link or e-newsletter service. content material as you probably did, the internet will be much more helpful than ever before. I waht tto counsel yoou ffew fascinating thingvs oor suggestions. Maaybe you could wtite next articdles regardiing this article. I desire tto lern mmore things abokut it! can’t wait to take a look when I get home. I’m shocked at how quick your blog loaded on my phone ..
Reading this info So i’m happy to show that I’ve a very good uncanny feeling I found out exactly what I needed. post to him. Pretty sure he’ll have a good read. I’ve been browsing online greater than 3 hours today, but I by no means discovered any interesting article like yours. onn building upp neew weblog. have to manually code with HTML. I’m starting a blog soon but have no coding expertise so I wanted to get guidance from someone with experience. Hi to all, the contents existing at this web page are actually amazing for people knowledge, well, keep up the nice work fellows. blog. It’s simple, yet effective. A lot of times it’s very difficult to get that « perfect balance » between superb usability and appearance. nowadays, but I by no means found any interesting article like yours. write subsequent articles relating to this article. old one! It’s on a completely different topic but it has pretty much the same layout and design. say on the topic of this piece of writing, in my view its really amazing for me. If some one wants expert view on the topic of blogging after that i suggest him/her to visit this website, Keep up the fastidious job. of writing here at this weblog, I have read all that, so at this time me also commenting here. Its like you read my thoughts! You appear to grasp so much about this, like you wrote the guide in it or something. Hello outstanding blog! Does running a blog such as this require a large amount of work? I have virtually no knowledge of coding however I had been hoping to start my own blog in the near future. Anyway, if you have any ideas or tips for new blog owners please share. I understand this is off topic but I just had to ask. Thanks a lot! Greetings from California! I’m bored at work so I decided to check out your site on my iphone during lunch break. I enjoy the information you provide here and can’t wait to take a look when I get home. I’m amazed at how fast your blog loaded on my phone .. I’m not even using WIFI, just 3G .. Anyways, excellent blog! Hmm it looks like your site ate my first comment (it was super long) so I guess I’ll just sum it up what I wrote and say, I’m thoroughly enjoying your blog. I too am an aspiring blog blogger but I’m still new to the whole thing. Do you have any tips for first-time blog writers? I’d genuinely appreciate it. With havin so much content and articles do you ever run into any issues of plagorism or copyright violation? My blog has a lot of exclusive content I’ve either written myself or outsourced but it looks like a lot of it is popping it up all over the web without my authorization. Do you know any solutions to help protect against content from being stolen? I’d really appreciate it. Do you have a spam issue on this site; I also am a blogger, and I was curious about your situation; many of us have developed some nice procedures and we are looking to exchange strategies with others, please shoot me an email if interested. Greetings from Los angeles! I’m bored to tears at work so I decided to check out your site on my iphone during lunch break. I love the info you present here and can’t wait to take a look when I get home. I’m surprised at how fast your blog loaded on my phone .. I’m not even using WIFI, just 3G .. Anyways, very good site! Very good blog you have here but I was curious if you knew of any discussion boards that cover the same topics talked about here? I’d really love to be a part of community where I can get feedback from other experienced individuals that share the same interest. If you have any suggestions, please let me know. Cheers! Have you ever considered about adding a little bit more than just your articles? I mean, what you say is valuable and all. Nevertheless just imagine if you added some great images or video clips to give your posts more, « pop »! Your content is excellent but with images and video clips, this website could undeniably be one of the most beneficial in its field. Terrific blog! Do you mind if I quote a few of your articles as long as I provide credit and sources back to your site? My blog is in the very same niche as yours and my users would truly benefit from a lot of the information you provide here. Please let me know if this okay with you. Many thanks! I am really loving the theme/design of your site. Do you ever run into any internet browser compatibility issues? A couple of my blog audience have complained about my blog not working correctly in Explorer but looks great in Opera. Do you have any solutions to help fix this issue? Have you ever thought about including a little bit more than just your articles? I mean, what you say is valuable and all. However think about if you added some great graphics or videos to give your posts more, « pop »! Your content is excellent but with images and video clips, this blog could undeniably be one of the very best in its niche. Fantastic blog! With havin so much content and articles do you ever run into any issues of plagorism or copyright violation? My website has a lot of unique content I’ve either written myself or outsourced but it looks like a lot of it is popping it up all over the web without my permission. Do you know any techniques to help protect against content from being stolen? I’d certainly appreciate it. First of all I would like to say terrific blog! I had a quick question which I’d like to ask if you do not mind. I was curious to find out how you center yourself and clear your head before writing. I’ve had trouble clearing my thoughts in getting my ideas out. I do enjoy writing but it just seems like the first 10 to 15 minutes are generally lost just trying to figure out how to begin. Any ideas or hints? Thanks! We stumbled over here coming from a different web address and thought I may as well check things out. I like what I see so i am just following you. Look forward to looking at your web page yet again. Hi would you mind letting me know which web host you’re using? I’ve loaded your blog in 3 different browsers and I must say this blog loads a lot faster then most. Can you recommend a good web hosting provider at a honest price? Many thanks, I appreciate it! Do you have a spam problem on this blog; I also am a blogger, and I was wondering your situation; many of us have created some nice methods and we are looking to trade methods with other folks, why not shoot me an e-mail if interested. this to my followers! Wonderful blog and terrific design. here Choice Rewards Credit Card Sign In – Rx Online Blog. places, I would like to keep up with anything new you have to post. Could you make a list of the complete urls of all your social sites like your Facebook page, twitter feed, or linkedin profile? Thanks for all of the efforts on this site. My niece enjoys going through research and it’s easy to understand why. We all notice all of the powerful tactic you produce important steps on the web blog and therefore increase response from visitors on this area of interest while my girl is becoming educated a lot. Take advantage of the remaining portion of the new year. You are performing a tremendous job. Thank you for some other excellent article. Where else may anyone get that type of information in such an ideal way of writing? I’ve a presentation subsequent week, and I’m at the search for such information. I really wanted to jot down a simple note so as to express gratitude to you for these unique tips you are posting here. My incredibly long internet look up has at the end of the day been recognized with incredibly good ideas to go over with my good friends. I ‘d declare that most of us site visitors actually are undeniably endowed to exist in a notable network with very many perfect individuals with great tips. I feel pretty blessed to have used your web page and look forward to tons of more fabulous times reading here. Thanks a lot once more for everything. Wow, wonderful blog format! How lengthy have you ever been blogging for? you make blogging look easy. The total glance of your site is magnificent, as well as the content material! Heya! I realize this is sort of off-topic but I needed to ask. Does managing a well-established blog like yours require a massive amount work? I’m brand new to blogging but I do write in my diary daily. I’d like to start a blog so I will be able to share my own experience and thoughts online. Please let me know if you have any kind of suggestions or tips for brand new aspiring blog owners. Appreciate it! I must express my respect for your generosity in support of those individuals that have the need for assistance with this one niche. Your special dedication to getting the solution around appears to be wonderfully significant and have usually made men and women much like me to reach their objectives. Your own warm and helpful advice means a great deal a person like me and somewhat more to my mates. Warm regards; from everyone of us. I am really enjoying the theme/design of your site. Do you ever run into any web browser compatibility problems? A few of my blog audience have complained about my site not operating correctly in Explorer but looks great in Opera. Do you have any ideas to help fix this issue? entire community might be thankful to you. But think of if you added some great visuals or video clips to give your posts more, « pop »! You are my aspiration , I have few blogs and rarely run out from to post .I conceive this site has some rattling good information for everyone. « There is nothing so disagreeable, that a patient mind cannot find some solace for it. » by Lucius Annaeus Seneca. Please let me know if you’re looking for a writer for your blog. You have some really good posts and I think I would be a good asset. If you ever want to take some of the load off, I’d absolutely love to write some material for your blog in exchange for a link back to mine. Please send me an email if interested. Thanks! Hola! I’ve been reading your blog for some time now and finally got the bravery to go ahead and give you a shout out from Austin Texas! Just wanted to mention keep up the fantastic job! Please let me know if you’re looking for a article author for your site. You have some really great articles and I feel I would be a good asset. If you ever want to take some of the load off, I’d absolutely love to write some content for your blog in exchange for a link back to mine. Please shoot me an e-mail if interested. Thank you! Have you ever thought about including a little bit more than just your articles? I mean, what you say is valuable and all. But think of if you added some great pictures or videos to give your posts more, « pop »! Your content is excellent but with pics and videos, this blog could undeniably be one of the greatest in its niche. Fantastic blog! Hey, I think your blog might be having browser compatibility issues. When I look at your blog site in Safari, it looks fine but when opening in Internet Explorer, it has some overlapping. I just wanted to give you a quick heads up! Other then that, terrific blog! When I initially commented I clicked the « Notify me when new comments are added » checkbox and now each time a comment is added I get three e-mails with the same comment. Is there any way you can remove me from that service? Thanks a lot! Hi there! Someone in my Facebook group shared this site with us so I came to take a look. I’m definitely enjoying the information. I’m book-marking and will be tweeting this to my followers! Wonderful blog and brilliant design. Do you have a spam issue on this blog; I also am a blogger, and I was curious about your situation; we have developed some nice practices and we are looking to trade strategies with others, be sure to shoot me an email if interested. Woah! I’m really digging the template/theme of this blog. It’s simple, yet effective. A lot of times it’s very hard to get that « perfect balance » between user friendliness and appearance. I must say that you’ve done a fantastic job with this. Also, the blog loads super fast for me on Opera. Superb Blog! Howdy! This post could not be written any better! Reading through this post reminds me of my good old room mate! He always kept chatting about this. I will forward this article to him. Fairly certain he will have a good read. Thanks for sharing! Normally I do not read post on blogs, but I wish to say that this write-up very compelled me to take a look at and do it! Your writing taste has been surprised me. Thank you, very nice article. My coder is trying to convince me to move to .net from PHP. I have always disliked the idea because of the expenses. But he’s tryiong none the less. I’ve been using WordPress on a variety of websites for about a year and am concerned about switching to another platform. I have heard fantastic things about blogengine.net. Is there a way I can import all my wordpress content into it? Any help would be greatly appreciated! My developer is trying to persuade me to move to .net from PHP. I have always disliked the idea because of the expenses. But he’s tryiong none the less. I’ve been using Movable-type on several websites for about a year and am concerned about switching to another platform. I have heard good things about blogengine.net. Is there a way I can import all my wordpress content into it? Any kind of help would be really appreciated! Hello! This is my 1st comment here so I just wanted to give a quick shout out and say I genuinely enjoy reading your blog posts. Can you recommend any other blogs/websites/forums that cover the same subjects? Thanks! Woah! I’m really digging the template/theme of this website. It’s simple, yet effective. A lot of times it’s very difficult to get that « perfect balance » between usability and visual appearance. I must say you have done a excellent job with this. In addition, the blog loads very fast for me on Firefox. Outstanding Blog! Have you ever considered creating an ebook or guest authoring on other sites? I have a blog centered on the same information you discuss and would love to have you share some stories/information. I know my visitors would enjoy your work. If you are even remotely interested, feel free to shoot me an email. Awesome blog you have here but I was curious if you knew of any discussion boards that cover the same topics talked about in this article? I’d really love to be a part of community where I can get comments from other experienced people that share the same interest. If you have any recommendations, please let me know. Thank you! Heya great website! Does running a blog such as this take a great deal of work? I’ve no understanding of coding however I was hoping to start my own blog in the near future. Anyways, if you have any recommendations or tips for new blog owners please share. I understand this is off topic however I simply had to ask. Many thanks! I am curious to find out what blog platform you are working with? I’m experiencing some small security problems with my latest site and I’d like to find something more risk-free. Do you have any suggestions? Thanks for your posting on this blog site. From my own personal experience, periodically softening upwards a photograph could possibly provide the wedding photographer with a little bit of an inventive flare. Often however, the soft clouds isn’t just what exactly you had planned and can sometimes spoil an otherwise good photo, especially if you intend on enlarging this. Hey there, I think your website might be having browser compatibility issues. When I look at your blog site in Chrome, it looks fine but when opening in Internet Explorer, it has some overlapping. I just wanted to give you a quick heads up! Other then that, superb blog! Hi! Someone in my Myspace group shared this website with us so I came to look it over. I’m definitely enjoying the information. I’m book-marking and will be tweeting this to my followers! Terrific blog and terrific design. Have you ever considered about adding a little bit more than just your articles? I mean, what you say is valuable and all. But just imagine if you added some great graphics or video clips to give your posts more, « pop »! Your content is excellent but with images and video clips, this blog could certainly be one of the best in its field. Awesome blog! Hi there, i read your blog occasionally and i own a similar one and i was just curious if you get a lot of spam remarks? If so how do you protect against it, any plugin or anything you can recommend? I get so much lately it’s driving me mad so any assistance is very much appreciated. Hey! I’m at work surfing around your blog from my new iphone 3gs! Just wanted to say I love reading through your blog and look forward to all your posts! Keep up the superb work! Superb blog you have here but I was curious if you knew of any discussion boards that cover the same topics talked about in this article? I’d really like to be a part of community where I can get feedback from other knowledgeable individuals that share the same interest. If you have any recommendations, please let me know. Thanks! Greetings from Idaho! I’m bored to tears at work so I decided to check out your blog on my iphone during lunch break. I love the information you present here and can’t wait to take a look when I get home. I’m shocked at how quick your blog loaded on my cell phone .. I’m not even using WIFI, just 3G .. Anyhow, good site! Hello! I’ve been reading your blog for a long time now and finally got the courage to go ahead and give you a shout out from Atascocita Texas! Just wanted to say keep up the good job! I conceive this site holds some rattling great information for everyone :D. « Calamity is the test of integrity. » by Samuel Richardson. Hi there! I know this is kinda off topic but I’d figured I’d ask. Would you be interested in trading links or maybe guest writing a blog article or vice-versa? My site discusses a lot of the same subjects as yours and I believe we could greatly benefit from each other. If you are interested feel free to send me an e-mail. I look forward to hearing from you! Great blog by the way! Hey there! I just wanted to ask if you ever have any trouble with hackers? My last blog (wordpress) was hacked and I ended up losing a few months of hard work due to no data backup. Do you have any methods to protect against hackers? When I originally commented I clicked the « Notify me when new comments are added » checkbox and now each time a comment is added I get four emails with the same comment. Is there any way you can remove people from that service? Thank you! Hey are using WordPress for your blog platform? I’m new to the blog world but I’m trying to get started and set up my own. Do you require any html coding knowledge to make your own blog? Any help would be really appreciated! I have been surfing online more than 3 hours today, yet I never found any interesting article like yours. It is pretty worth enough for me. In my opinion, if all website owners and bloggers made good content as you did, the web will be a lot more useful than ever before. I have learn a few good stuff here. Definitely value bookmarking for revisiting. I wonder how a lot effort you set to make the sort of wonderful informative site. You could definitely see your enthusiasm in the paintings you write. The arena hopes for even more passionate writers like you who aren’t afraid to mention how they believe. Always go after your heart. « A simple fact that is hard to learn is that the time to save money is when you have some. » by Joe Moore. Only a smiling visitor here to share the love (:, btw great design. « Everything should be made as simple as possible, but not one bit simpler. » by Albert Einstein. It is appropriate time to make some plans for the future and it’s time to be happy. I have read this post and if I could I wish to suggest you few interesting things or advice. Maybe you could write next articles referring to this article. I desire to read even more things about it! audio songs present at this site is genuinely wonderful. Hi my friend! I want to say that this post is awesome, great written and include almost all important infos. I’d like to peer more posts like this. I want to point out my appreciation for your kind-heartedness giving support to those individuals that must have help on that study. Your real commitment to getting the message across appeared to be exceedingly effective and has consistently enabled girls just like me to arrive at their pursuits. Your warm and helpful help entails a lot a person like me and still more to my mates. Thanks a lot; from each one of us. Usually I do not read article on blogs, however I would like to say that this write-up very pressured me to check out and do it! Your writing taste has been amazed me. Thank you, quite nice post. I was just looking for this info for some time. After 6 hours of continuous Googleing, at last I got it in your web site. I wonder what is the lack of Google strategy that don’t rank this kind of informative websites in top of the list. Normally the top sites are full of garbage. I like this website so much, saved to my bookmarks. « Nostalgia isn’t what it used to be. » by Peter De Vries. Hi are using WordPress for your blog platform? I’m new to the blog world but I’m trying to get started and create my own. Do you require any coding expertise to make your own blog? Any help would be greatly appreciated! Hi excellent website! Does running a blog similar to this take a great deal of work? I’ve absolutely no knowledge of computer programming however I had been hoping to start my own blog soon. Anyhow, should you have any suggestions or tips for new blog owners please share. I know this is off subject however I simply wanted to ask. Thanks! Hey! I just wanted to ask if you ever have any problems with hackers? My last blog (wordpress) was hacked and I ended up losing many months of hard work due to no back up. Do you have any methods to protect against hackers? Utterly written written content, Really enjoyed reading. I’ll immediately seize your rss feed as I can not in finding your email subscription hyperlink or newsletter service. Do you have any? Please permit me recognize so that I could subscribe. Thanks. Do you mind if I quote a couple of your posts as long as I provide credit and sources back to your blog? My blog is in the exact same niche as yours and my visitors would really benefit from some of the information you present here. Please let me know if this ok with you. Thanks a lot! I like this website very much, Its a very nice billet to read and receive info . « You can never learn less, you can only learn more. » by Richard Buckminster Fuller. Just wish to say your article is as surprising. The clarity in your post is just excellent and i can assume you are an expert on this subject. Well with your permission allow me to grab your RSS feed to keep updated with forthcoming post. Thanks a million and please continue the enjoyable work. I like this blog very much, Its a real nice berth to read and get info . « Education is the best provision for old age. » by Aristotle. Hello there, I found your blog by means of Google even as searching for a similar matter, your web site came up, it appears good. I’ve bookmarked it in my google bookmarks. Usually I don’t learn post on blogs, however I would like to say that this write-up very forced me to try and do so! Your writing taste has been surprised me. Thank you, very nice post. I wish to express my respect for your generosity giving support to men who absolutely need help on this subject matter. Your very own commitment to passing the message all-around came to be wonderfully beneficial and have specifically enabled people just like me to reach their goals. Your personal insightful useful information implies a whole lot to me and far more to my peers. Regards; from all of us. Wow! This could be one particular of the most useful blogs We’ve ever arrive across on this subject. Basically Magnificent. I am also an expert in this topic so I can understand your hard work. Do you mind if I quote a couple of your posts as long as I provide credit and sources back to your blog? My blog is in the very same niche as yours and my users would certainly benefit from some of the information you provide here. Please let me know if this alright with you. Cheers! Hey there would you mind stating which blog platform you’re using? I’m planning to start my own blog soon but I’m having a hard time choosing between BlogEngine/Wordpress/B2evolution and Drupal. The reason I ask is because your design seems different then most blogs and I’m looking for something unique. P.S Apologies for being off-topic but I had to ask! I’m curious to find out what blog system you’re utilizing? I’m having some minor security problems with my latest website and I would like to find something more safeguarded. Do you have any suggestions? Greetings! I’ve been following your website for a long time now and finally got the bravery to go ahead and give you a shout out from Porter Texas! Just wanted to tell you keep up the excellent job! Have you ever thought about publishing an e-book or guest authoring on other sites? I have a blog centered on the same subjects you discuss and would love to have you share some stories/information. I know my viewers would enjoy your work. If you’re even remotely interested, feel free to send me an e-mail. Hi there, i read your blog occasionally and i own a similar one and i was just curious if you get a lot of spam comments? If so how do you reduce it, any plugin or anything you can advise? I get so much lately it’s driving me insane so any assistance is very much appreciated. Have you ever considered about including a little bit more than just your articles? I mean, what you say is valuable and all. However think about if you added some great photos or videos to give your posts more, « pop »! Your content is excellent but with images and videos, this site could definitely be one of the best in its niche. Good blog! Excellent post however , I was wondering if you could write a litte more on this subject? I’d be very grateful if you could elaborate a little bit more. Bless you! My programmer is trying to convince me to move to .net from PHP. I have always disliked the idea because of the expenses. But he’s tryiong none the less. I’ve been using Movable-type on various websites for about a year and am concerned about switching to another platform. I have heard great things about blogengine.net. Is there a way I can import all my wordpress content into it? Any help would be greatly appreciated! Today, I went to the beachfront with my children. I found a sea shell and gave it to my 4 year old daughter and said « You can hear the ocean if you put this to your ear. » She put the shell to her ear and screamed. There was a hermit crab inside and it pinched her ear. She never wants to go back! LoL I know this is totally off topic but I had to tell someone! Superb blog! Do you have any helpful hints for aspiring writers? I’m hoping to start my own blog soon but I’m a little lost on everything. Would you advise starting with a free platform like WordPress or go for a paid option? There are so many choices out there that I’m totally confused .. Any tips? Appreciate it! hello!,I like your writing very so much! proportion we keep in touch extra about your article on AOL? I need a specialist on this area to unravel my problem. Maybe that is you! Having a look forward to peer you. My husband and i were very more than happy when Ervin could deal with his inquiry through the precious recommendations he acquired in your site. It is now and again perplexing to just find yourself offering secrets and techniques that the rest could have been trying to sell. We really grasp we now have the writer to be grateful to because of that. These explanations you’ve made, the straightforward blog menu, the relationships your site assist to engender – it’s most terrific, and it’s really letting our son and our family reckon that this subject is amusing, which is certainly highly vital. Thanks for all the pieces! Excellent read, I just passed this onto a colleague who was doing a little research on that. And he just bought me lunch as I found it for him smile So let me rephrase that: Thank you for lunch! « We have two ears and one mouth so that we can listen twice as much as we speak. » by Epictetus. Whats Going down i’m new to this, I stumbled upon this I’ve found It positively helpful and it has helped me out loads. I’m hoping to contribute & aid different customers like its helped me. Good job. I’ve been browsing online greater than three hours these days, but I never found any interesting article like yours. It is pretty value sufficient for me. Personally, if all webmasters and bloggers made just right content material as you did, the web will be a lot more helpful than ever before. « Dignity is not negotiable. Dignity is the honor of the family. » by Vartan Gregorian. I have read a few excellent stuff here. Definitely price bookmarking for revisiting. I surprise how much effort you set to make this kind of wonderful informative web site. Thanks for another excellent post. The place else may anybody get that kind of info in such a perfect manner of writing? I’ve a presentation next week, and I am on the look for such information. Hello.This article was extremely fascinating, particularly since I was looking for thoughts on this topic last Thursday. I together with my guys were checking out the excellent tricks found on your site then at once came up with a terrible suspicion I had not thanked you for those strategies. The young boys came totally stimulated to read them and have in reality been using these things. Appreciate your genuinely well helpful and also for deciding upon variety of useful things millions of individuals are really desperate to discover. My personal honest apologies for not expressing appreciation to sooner. Hello, Neat post. There is an issue together with your web site in internet explorer, could check this¡K IE still is the market leader and a huge section of other folks will omit your magnificent writing due to this problem. I am no longer sure where you’re getting your information, however good topic. I must spend a while finding out much more or figuring out more. Thanks for wonderful info I used to be on the lookout for this info for my mission. You can certainly see your expertise within the paintings you write. The arena hopes for even more passionate writers such as you who are not afraid to say how they believe. At all times go after your heart. « Everyone has his day and some days last longer than others. » by Sir Winston Leonard Spenser Churchill. I do accept as true with all the ideas you’ve offered for your post. They’re very convincing and will certainly work. Still, the posts are too short for novices. May just you please extend them a bit from subsequent time? Thanks for the post. Needed to write you one bit of note in order to say thank you over again for your personal beautiful concepts you have shared in this case. It has been surprisingly open-handed of people like you to provide unreservedly what exactly many of us could have supplied as an ebook to get some cash for their own end, notably considering that you could have done it if you desired. The things in addition acted like a fantastic way to fully grasp other people have a similar desire similar to mine to figure out lots more in respect of this matter. I’m certain there are a lot more enjoyable moments ahead for people who looked at your blog post. I¡¦m not certain the place you’re getting your information, however great topic. I must spend a while learning more or working out more. Thanks for excellent information I used to be searching for this info for my mission. Wow! This can be one particular of the most useful blogs We have ever arrive across on this subject. Basically Great. I’m also an expert in this topic so I can understand your hard work. hello!,I like your writing very a lot! proportion we communicate extra approximately your article on AOL? I require a specialist in this space to unravel my problem. May be that is you! Taking a look ahead to peer you. I do agree with all of the ideas you have introduced to your post. They’re really convincing and can certainly work. Nonetheless, the posts are very quick for newbies. Could you please prolong them a little from subsequent time? Thank you for the post. Whats Going down i’m new to this, I stumbled upon this I have discovered It absolutely helpful and it has aided me out loads. I am hoping to give a contribution & assist other customers like its helped me. Good job. hi!,I really like your writing very a lot! proportion we communicate extra approximately your article on AOL? I require a specialist in this area to unravel my problem. May be that is you! Having a look ahead to see you. you are in point of fact a just right webmaster. The web site loading speed is amazing. It seems that you are doing any distinctive trick. Also, The contents are masterwork. you’ve done a great process in this topic! I would like to voice my passion for your kindness supporting men and women who have the need for help with in this content. Your personal dedication to getting the solution all-around has been especially useful and have in most cases permitted most people just like me to arrive at their pursuits. The interesting information signifies a lot to me and substantially more to my fellow workers. Thank you; from everyone of us. Have you ever considered about adding a little bit more than just your articles? I mean, what you say is valuable and all. But just imagine if you added some great pictures or video clips to give your posts more, « pop »! Your content is excellent but with pics and videos, this website could certainly be one of the best in its niche. Superb blog! Hello, I think your website might be having browser compatibility issues. When I look at your blog site in Firefox, it looks fine but when opening in Internet Explorer, it has some overlapping. I just wanted to give you a quick heads up! Other then that, fantastic blog! It’s a pity you don’t have a donate button! I’d without a doubt donate to this fantastic blog! I guess for now i’ll settle for book-marking and adding your RSS feed to my Google account. I look forward to brand new updates and will talk about this website with my Facebook group. Chat soon! I am really enjoying the theme/design of your web site. Do you ever run into any browser compatibility issues? A few of my blog visitors have complained about my site not operating correctly in Explorer but looks great in Safari. Do you have any advice to help fix this problem? Do you have a spam issue on this site; I also am a blogger, and I was wanting to know your situation; many of us have created some nice practices and we are looking to swap solutions with others, please shoot me an email if interested. Please let me know if you’re looking for a article writer for your weblog. You have some really great posts and I think I would be a good asset. If you ever want to take some of the load off, I’d love to write some articles for your blog in exchange for a link back to mine. Please send me an email if interested. Regards! Please let me know if you’re looking for a writer for your blog. You have some really good articles and I believe I would be a good asset. If you ever want to take some of the load off, I’d absolutely love to write some material for your blog in exchange for a link back to mine. Please send me an e-mail if interested. Thanks! I am curious to find out what blog system you are using? I’m having some small security problems with my latest website and I would like to find something more safeguarded. Do you have any suggestions? Admiring the commitment you put into your site and in depth information you provide. It’s great to come across a blog every once in a while that isn’t the same outdated rehashed information. Great read! I’ve saved your site and I’m including your RSS feeds to my Google account. Appreciating the persistence you put into your site and in depth information you offer. It’s awesome to come across a blog every once in a while that isn’t the same unwanted rehashed information. Fantastic read! I’ve saved your site and I’m including your RSS feeds to my Google account. Hi would you mind sharing which blog platform you’re working with? I’m going to start my own blog soon but I’m having a difficult time choosing between BlogEngine/Wordpress/B2evolution and Drupal. The reason I ask is because your layout seems different then most blogs and I’m looking for something unique. P.S My apologies for getting off-topic but I had to ask! Hello! I know this is somewhat off-topic however I had to ask. Does building a well-established blog like yours take a massive amount work? I’m brand new to blogging but I do write in my journal on a daily basis. I’d like to start a blog so I can easily share my personal experience and thoughts online. Please let me know if you have any suggestions or tips for brand new aspiring bloggers. Thankyou! Have you ever thought about writing an e-book or guest authoring on other websites? I have a blog based upon on the same information you discuss and would love to have you share some stories/information. I know my subscribers would value your work. If you’re even remotely interested, feel free to send me an e mail. I like what you guys are usually up too. Such clever work and coverage! Keep up the wonderful works guys I’ve included you guys to my personal blogroll. Howdy would you mind stating which blog platform you’re working with? I’m going to start my own blog soon but I’m having a hard time choosing between BlogEngine/Wordpress/B2evolution and Drupal. The reason I ask is because your layout seems different then most blogs and I’m looking for something unique. P.S Sorry for being off-topic but I had to ask! My programmer is trying to persuade me to move to .net from PHP. I have always disliked the idea because of the costs. But he’s tryiong none the less. I’ve been using Movable-type on a variety of websites for about a year and am nervous about switching to another platform. I have heard great things about blogengine.net. Is there a way I can transfer all my wordpress content into it? Any kind of help would be really appreciated! Some truly superb info , Gladiola I observed this. « Three things you can be judged by your voice, your face, and your disposition. » by Ignas Bernstein. Superb website you have here but I was wondering if you knew of any user discussion forums that cover the same topics talked about in this article? I’d really like to be a part of group where I can get opinions from other knowledgeable individuals that share the same interest. If you have any suggestions, please let me know. Appreciate it! Hi my loved one! I wish to say that this article is amazing, nice written and include approximately all important infos. I¡¦d like to look extra posts like this . Rattling great info can be found on website . « An executive is a person who always decides sometimes he decides correctly, but he always decides. » by John H. Patterson. Hi, i read your blog from time to time and i own a similar one and i was just curious if you get a lot of spam feedback? If so how do you reduce it, any plugin or anything you can suggest? I get so much lately it’s driving me insane so any support is very much appreciated. Greetings! I’ve been reading your site for a while now and finally got the bravery to go ahead and give you a shout out from Lubbock Tx! Just wanted to say keep up the good job! Hey I am so excited I found your website, I really found you by accident, while I was browsing on Askjeeve for something else, Regardless I am here now and would just like to say many thanks for a remarkable post and a all round enjoyable blog (I also love the theme/design), I don’t have time to read it all at the moment but I have saved it and also added in your RSS feeds, so when I have time I will be back to read a great deal more, Please do keep up the superb job. Hey! This post could not be written any better! Reading this post reminds me of my good old room mate! He always kept talking about this. I will forward this article to him. Pretty sure he will have a good read. Many thanks for sharing! Hey there! Someone in my Facebook group shared this website with us so I came to take a look. I’m definitely loving the information. I’m bookmarking and will be tweeting this to my followers! Great blog and brilliant style and design. Great blog! Do you have any hints for aspiring writers? I’m hoping to start my own site soon but I’m a little lost on everything. Would you recommend starting with a free platform like WordPress or go for a paid option? There are so many options out there that I’m totally overwhelmed .. Any ideas? Thank you! Thanks for the marvelous posting! I definitely enjoyed reading it, you will be a great author.I will be sure to bookmark your blog and will often come back later in life. I want to encourage you to ultimately continue your great job, have a nice morning! I really like what you guys are up too. Such clever work and coverage! Keep up the excellent works guys I’ve included you guys to blogroll. Hi there! I could have sworn I’ve been to this website before but after reading through some of the post I realized it’s new to me. Anyways, I’m definitely delighted I found it and I’ll be book-marking and checking back frequently! Heya! I’m at work surfing around your blog from my new iphone 4! Just wanted to say I love reading through your blog and look forward to all your posts! Carry on the outstanding work! Wonderful goods from you, man. I’ve understand your stuff previous to and you’re just too excellent. I actually like what you’ve acquired here, really like what you’re saying and the way in which you say it. You make it entertaining and you still take care of to keep it wise. I can not wait to read far more from you. This is really a terrific website. Thanks for some other great post. The place else could anybody get that kind of info in such a perfect way of writing? I have a presentation subsequent week, and I’m at the search for such information. Hi! I’ve been following your blog for some time now and finally got the bravery to go ahead and give you a shout out from Atascocita Texas! Just wanted to say keep up the good job! My partner and I absolutely love your blog and find many of your post’s to be exactly I’m looking for. can you offer guest writers to write content to suit your needs? I wouldn’t mind producing a post or elaborating on most of the subjects you write related to here. Again, awesome website! First off I would like to say awesome blog! I had a quick question which I’d like to ask if you do not mind. I was curious to know how you center yourself and clear your head before writing. I’ve had a tough time clearing my thoughts in getting my thoughts out there. I do enjoy writing however it just seems like the first 10 to 15 minutes are lost simply just trying to figure out how to begin. Any recommendations or tips? Appreciate it! I and my buddies ended up reading the best guidelines on the website and so instantly developed a horrible feeling I had not thanked the blog owner for those strategies. My men are already for this reason happy to see all of them and already have actually been taking pleasure in them. Appreciation for really being so kind and then for going for variety of outstanding subjects most people are really eager to learn about. My very own honest regret for not saying thanks to you earlier. It’s actually very complicated in this full of activity life to listen news on TV, therefore I simply use the web for that reason, and take the newest information. Thanks a bunch for sharing this with all folks you actually realize what you’re speaking approximately! Bookmarked. Kindly also seek advice from my website =). We may have a link exchange contract among us! My partner and I stumbled over here different web page and thought I should check things out. I like what I see so now i’m following you. Look forward to finding out about your web page again. Hey, I think your website might be having browser compatibility issues. When I look at your website in Safari, it looks fine but when opening in Internet Explorer, it has some overlapping. I just wanted to give you a quick heads up! Other then that, wonderful blog! whoah this weblog is fantastic i really like studying your posts. Stay up the good work! You know, many individuals are hunting round for this information, you can help them greatly. With havin so much content and articles do you ever run into any problems of plagorism or copyright infringement? My website has a lot of exclusive content I’ve either authored myself or outsourced but it appears a lot of it is popping it up all over the web without my authorization. Do you know any ways to help reduce content from being ripped off? I’d definitely appreciate it. My partner and I stumbled over here different web page and thought I might check things out. I like what I see so now i’m following you. Look forward to exploring your web page repeatedly. I have been examinating out a few of your posts and i can claim pretty clever stuff. I will surely bookmark your site. Merely wanna input that you have a very nice site, I enjoy the layout it actually stands out.